Welcome to Summit Wood Products where we create and sell a selection of high-quality hand-made items using only the best grade materials. Our Quilt Racks and Stands are built right here in the USA from solid pieces of high quality oak, cherry or walnut hardwood, along with our Seam Rippers and Pens which are hand-turned from solid blocks of colorful acrylic or wood and polished to a high luster. Ideal for showing off your beautiful quilts. 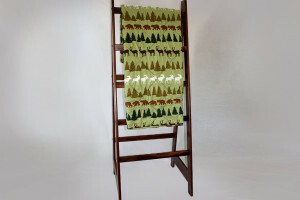 Summit Wood Products Quilt Ladders and Stands, available in Oak, Cherry, and American Walnut hardwoods, have smooth, sturdy rungs to put your quilts over so they all can be displayed and you can change your quilts as often as you like. This is one tool of the trade that you hope you don’t need to use, but when you do need it, you don’t want to be without one! 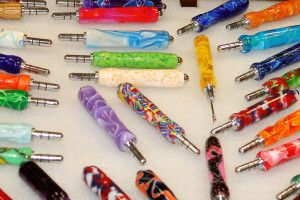 SWP Seam Rippers are easy to handle and very sharp, and we are not just talking about how good they look! 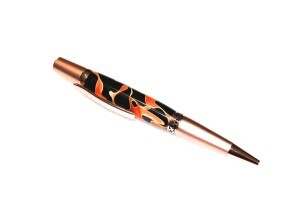 Summit Wood Products also manufactures hand-turned pens that are both distinctive and functional, created from several types of wood, or from one of the dozens of available acrylic colors and patterns. You will never hear someone say, “I have one just like that”. 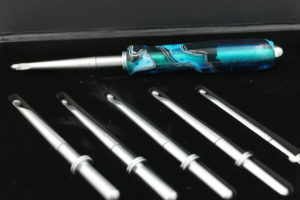 Beautiful and unique with one of a kind hand turned acrylic handle. Comes with 6 interchangeable hook sizes (C/2, D/3, E/4, F/5, G/6, H/8 ) Has a box to hold all hooks and handle. FREE Shipping ! © 2019 Summit Wood Products. All Rights Reserved.